Vantage Point is Pipkins’ premier enterprise workforce management (EWM) product, featuring comprehensive scheduling, forecasting, and planning functionality for complete enterprise-wide, front office, back office, multi-site, contact center workforce management (WFM) and performance management. At Pipkins, we understand that details matter with every contact. Vantage Point, uniquely handles every contact that comes into organizations, including calls, chat, text message, e-mail, and back office work items. Pipkins utilizes our own state-of-the-art algorithms developed by founder, Dr. James Pipkins. The use of these algorithms makes Vantage Point simply the most accurate forecasting product on the market, enabling companies to solve complex operational issues in today's multi-faceted omni-channel workforce management environments. Vantage Point gives organizations a proven WFM solution with the ability to automate processes and reduce costs. Lower stress levels for your front line teams and their supervisors. It’s a win-win, all the way around! The forecasting and scheduling tool in Vantage Point uses Pipkins’ proprietary algorithms. Inbound - Vantage Point handles standard parameters such as Service Objectives, Average Speed of Answer, and AHT by applying additional variables around Busies and Mean Time to Abandoned. This is performed at the time step level all the way to 5 minutes, if needed, providing a more accurate staffing requirement. Outbound - In addition to standard call and handling time, VantagePoint is able to pull in campaigns and apply variables such as the minimum percentage of connected calls to be handled and percentage of attempted of calls that connect. Chat - Vantage Point uniquely manages chat by taking into account that multiple sessions can occur at any given time, and inbound and outbound capabilities need to be applied according to how organizations manage their strategy. Additionally, all other Merlang parameters can be applied to ensure optimal chat staffing requirements. In a dynamic chat model, Vantage Point maximizes off-line time for agents to pick up chat during down times. Back Office and Email - E-mails, which do not typically abandon, need to be considered in staffing parameters. Minimum percentage of requests processed, Average Handling Time, as well as Extended Service Objectives (Days, Hours, Minutes) ensure staffing requirements for e-mail work items. Once Merlang parameters have been applied, Vantage Point will apply its unique Sum of Squares algorithms to look at every interval of requirements. Unlike other workforce management systems that utilize a "net to zero" model, which looks at an end of day net to zero staffing line, the more accurate Sum of Squares model looks at every interval of staffing requirements. The system then runs continuous schedule scenarios, adjusting for start/stop times, breaks, lunches, etc., until the most optimal schedule for every interval throughout the day is produced. Day-to-day management of organizational activities is critical as unexpected spikes in workloads occur, while staffing changes simultaneously arise. As agents call in sick and meetings occur, organizations are affected, and real time tools are critical to evaluate how daily workforce management goals are being affected. Utilization of Pipkins' tools, such as the more than 100 comparison statistics in reporting, numerous change management tools, and real time views into agent metrics, can ensure that organizations meet their operational goals. It's all here in Vantage Point. Click here to view, download or print the Vantage Point Info Sheet. Want to know more? 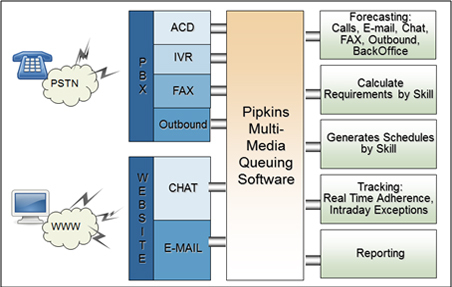 Read about Pipkins’ Advanced Forecasting capabilities and our proprietary Merlang® algorithm.